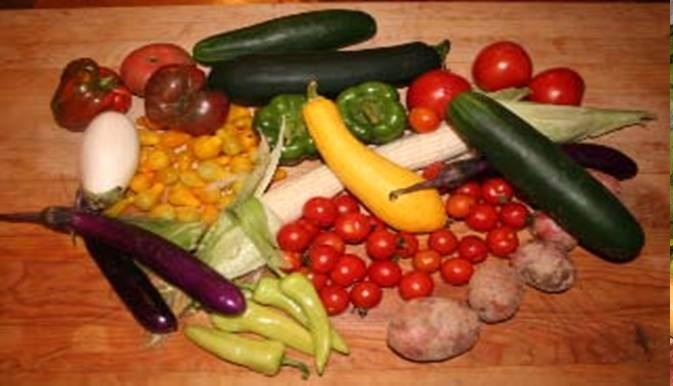 The following is a list of what is grown in CSA Season. 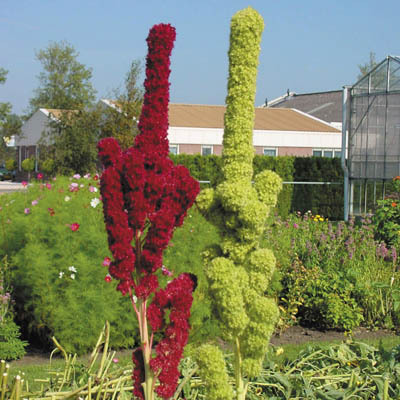 This eye-catching annual, which grows 2 to 3 feet in height and bears velvety magenta florets on its unique “towers,” looks like a well-groomed topiary. With richly colored blooms that measure several inches around, these distinctly ornamental flowers are striking in containers—either alone or in combination with other summer flowers. 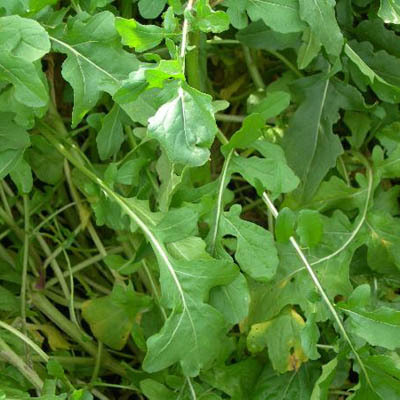 This nutty tasting herb is probably the variety of choice for arugula newbies not quite prepared for the spicy punch of Rocket or other selections. With its lush and nutritious long leaves, this annual member of the mustard family is spicy enough to complement traditional greens but mild enough that it doesn’t overpower the salad bowl. If the rich, peppery taste of this low-calorie salad green isn’t enough to entice you, consider this: its seed has traditionally been used in aphrodisiac potions. 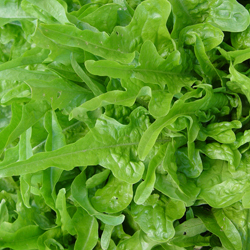 Also known as “rocket,” arugula’s potent flavor makes it a fine complement to such milder salad fare as romaine lettuce. Or try sautéing it in olive oil. Here’s a 2-foot-tall annual whose flowers boast fully crested centers surrounded by several rows of richly colored petals, including azure, crimson, peach, pink, purple, rose, scarlet, and white. 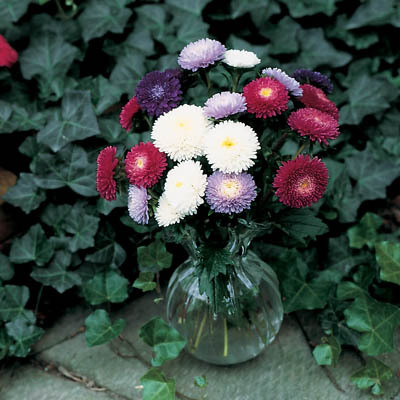 The aster’s strong stems make this an ideal plant for cutting, and the brilliant flowers—a popular choice for cut-flower arrangements—are long-lasting. Of the 150 or so varieties of basil, this sweet strain is the one of choice for pesto (in fact, it was bred for the nutty sauce). And with its pleasant, intense flavor, the large-leafed Genovese basil is also a great flavoring—whether fresh or dried—for tomatoes, marinades, oils, and other foods. What’s more, basil tea has traditionally been used as a digestive aid. 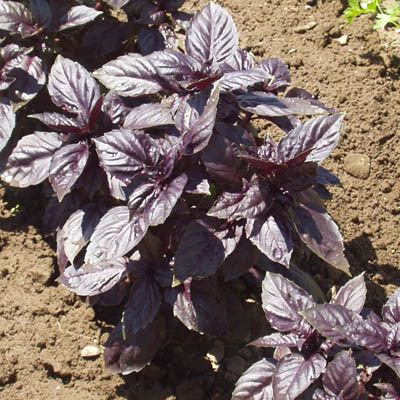 A large Italian basil with a copper tinge to its dark purplish-red leaves, Red Rubin will add both color and a clove-like spiciness to salads, vinegars, and pasta dishes. 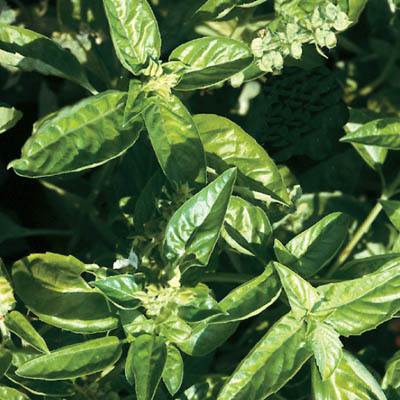 Also known as Opal basil, this herb is also a great complement to everything from rice to eggplant to spaghetti sauces. But it’s too bold for pesto, so use our Genovese basil instead. 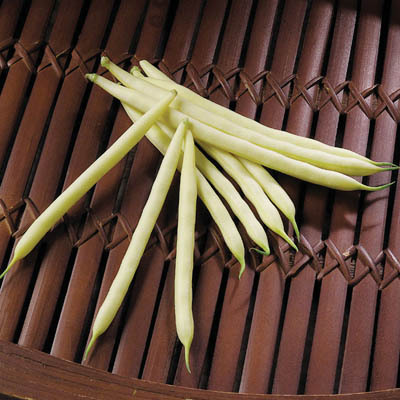 Slim, yellow wax beans with white seeds, these tasty bush beans supply beta-carotene, fiber, and such minerals as iron and potassium. Try them blanched and then sautéed with garlic and olive oil. Or mix them with our deep-green Crockett beans in a potato-green bean salad with lemon and basil that’s perfect for picnics. 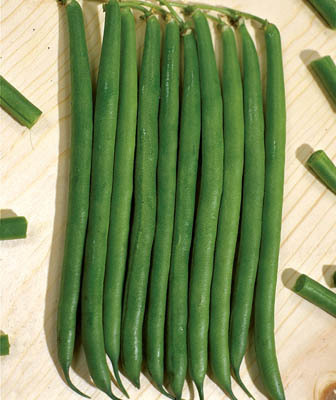 Our dark-green string beans (aka snap beans), which grow to about 6 inches, are sweet and flavorful. Packed with vitamin C, these filet-type beans (i.e., they’re stringless at maturity) are great gently steamed or stir-fried. But they’re also good in casseroles and, for the more adventurous, are fine for canning or freezing. 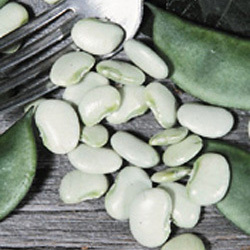 Fresh and succulent, Eastland lima beans boast 3-to-4-inch pods filled with dime-sized beans. High in protein and low in fat, these greenish-white legumes are also rich in iron and provide a particularly good source of cholesterol-lowering fiber, making them a heart-healthy addition to your diet. We like them with rice or in a mixed-bean salad. 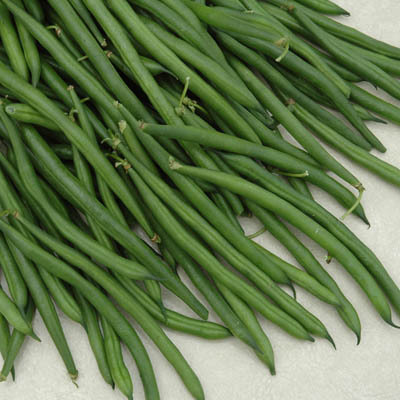 Boil, steam, or stir fry a side dish of these vegetables, and the command “Eat your green beans” may no longer be ignored. Known also as snap beans or string beans (even though they’re string-less), green beans are rich in vitamins, minerals, and dietary fiber. This variety boasts a straight, smooth, 6-inch pod that’s as visually appealing as it is good tasting. Organic Touchstone Gold is an outstanding golden beet that produces uniformly round roots with smooth, bright orange skin and a vivid golden interior. 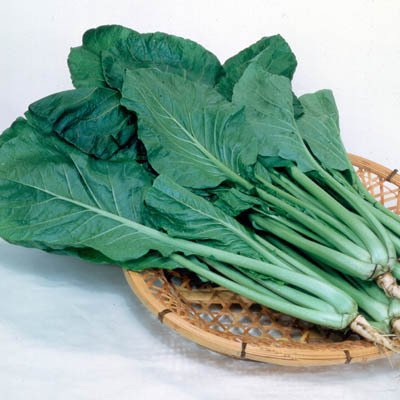 It has deep green erect tops and the golden interior has an excellent quality and retains its color when cooked. 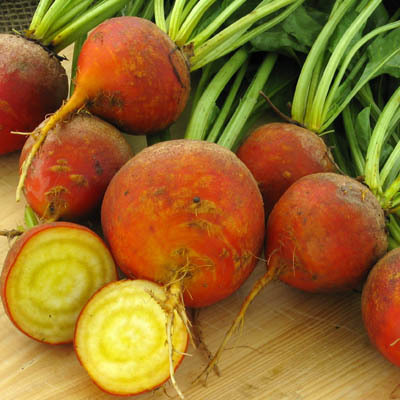 Compared to other golden beets, Touchstone Gold has a better germ, more uniformly round roots, much smoother shoulders, and less zoning. Beets are incredibly versatile (roast, steam, boil, juice, grate, pickle them or cook up some borscht), and the tender, smooth-textured warrior beets we grow are ideal for any such use. Not only are these root vegetables naturally sweet (and their tops a tasty green), but the pigment that gives them their purple color has been hailed as a cancer-fighting agent. 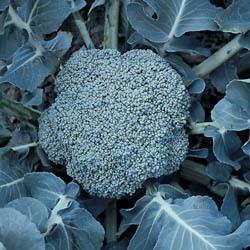 Packman hybrid broccoli boasts mild-tasting, medium-green heads that grow to about 8 inches in diameter. Rich in vitamins A, C, and K, as well as nutrients with anti-cancer properties, the florets can be boiled, steamed, stir-fried, or eaten raw. And add the leaves to your salad: they’re both delicious and packed with beta-carotene. Peel the folded outer leaves off the head of this popular leafy green vegetable and you’ve got the makings of everything from coleslaw and sauerkraut to soups and stir-fry. Rich in vitamin C and the amino acid glutamine, a natural anti-inflammatory, this spicy—some say bitter—vegetable is high in dietary fiber and ideal for weight-loss programs. Don’t let the squat shape throw you: these 6-inch carrots, which are broad and blocky rather than thin and tapered, boast a fine texture and lip-smacking sweetness that make them ideal for anything from stews to soups (they’re particularly good for juicing). 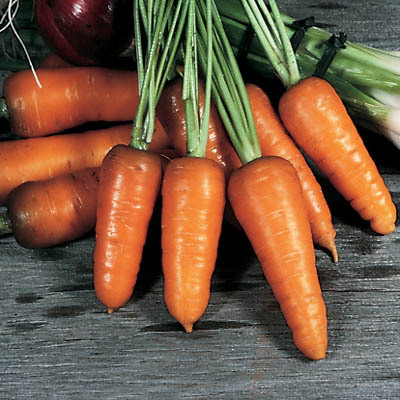 Like other carrots, they’re rich in the antioxidant beta-carotene, which is converted in the liver to vitamin A. 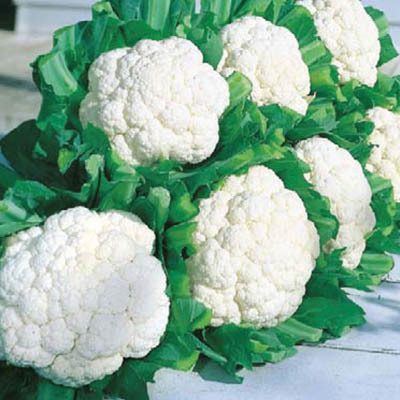 Low in fat, high in fiber and vitamin C, cauliflower is versatile: pickle it, add it raw to a salad (our Olympia spinach is a perfect complement), boil, steam, or fry it. The Snow Crown variety, which weighs in at 1 to 2 pounds, has an 8-inch head whose florets are unusually flavorful. Low in starch, dieters will find it a perfect potato substitute. This foot-high, flat-branched perennial, a staple of Asian cooking, is often used in stir-fry and to replace garlic in sauces and salads. 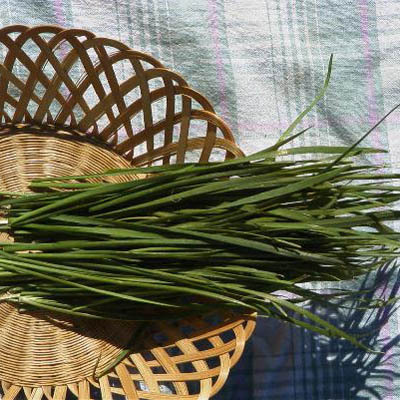 A relative newcomer to American kitchens, with a relatively mild taste similar to that of garlic or green onions, this mild chive works as well on mashed potatoes and other vegetables as it does on pizza or garlic bread. Known alternatively as slow bolt cilantro (bolting means that the plant starts to produce seed, rather than growing more leaves), this pungent member of the carrot family is a favored ingredient for Asian and Latin American cuisine, including salsa and other Mexican dishes. The spice, coriander, is the plant’s mature, dried seed—a staple of Indian cooking. Low in calories and packed with nutrients, collard greens—a close relative of kale and cabbage—can be boiled, simmered, or, if you’re a devotee of traditional Southern cuisine, paired with cornbread and black-eyed peas. 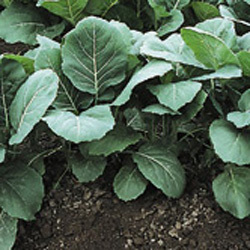 The Champion collard boasts smooth, thick, blue-green leaves that are particularly flavorful when sautéed in olive oil and garlic. 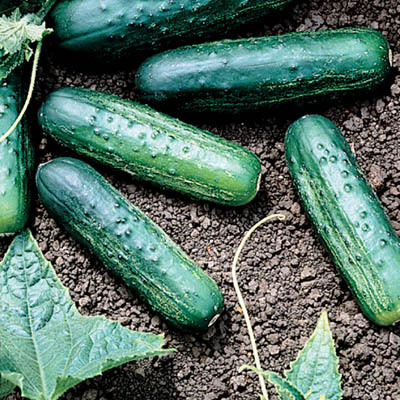 This dark-green hybrid packs a one-two punch: it’s great in salads and terrific for pickling. Like other cukes, the Eureka is low in calories and rich in vitamins (A and C) and minerals (calcium and potassium, among others). Try them in home-made gazpacho, or throw caution to the hot, summer wind with cucumber lemonade. 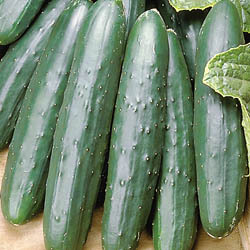 With its straight, cylindrical fruit, the dark-green and glossy Indy is the ideal cucumber for slicing. Low in cholesterol and rich in potassium and vitamin K, this cuke is great in salads (we particularly like Shirazi) and on sandwiches (with onion or avocado, for example). Or simply garnish them with basil or other herbs. The aromatic green leaves of this annual herb, whether they’re dried or fresh, are ideal for sprinkling on such vegetables as spinach, green beans, and new potatoes, and also mixing into dips and sauces. And use the seeds of Bouquet—the most widely grown dill—for making dill pickles and seasoning your potato salad and coleslaw. This leafy member of the daisy family, which packs a bold, slightly bitter taste, is a terrific addition to a garden salad; additionally, it can be steamed, stir-fried, braised, or roasted for a side dish. A great source of folate, our “salad king” endive stores well in an airtight container or plastic bag in the crisper. 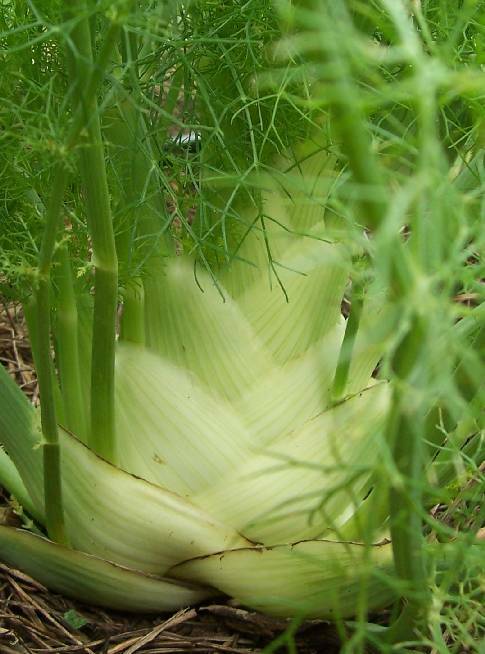 Also known as finocchio, this hardy herb is aromatic and flavorful, with celery-like leaves and a swollen, bulb-like stem that can be blanched and eaten as a vegetable. Use the leaves—with their hint of licorice—in salads and other cold dishes; slice or mince the bulbs and mix with greens, sprinkle with olive oil for an appetizer, or even use it to make ketchup. 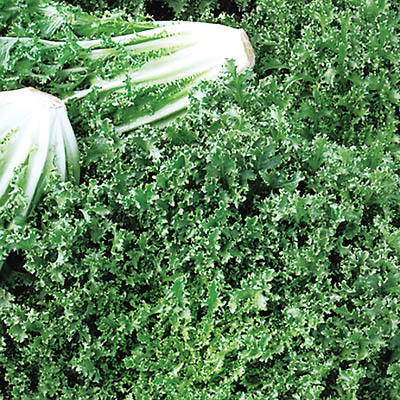 This Dutch hybrid has thick and ruffled blue-green leaves that are an ideal addition to salad mixes. Rich in vitamins A and C, high in potassium, calcium, and iron, this sweet green—which is not as tender as spinach and collard greens, for example—can also be boiled, stir-fried, or roasted, and adds real zest to white-bean soup. 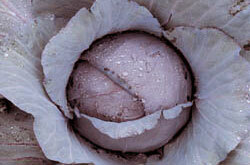 For the uninitiated, kohlrabi is a member of the cabbage family that resembles a turnip, but grows above the ground. 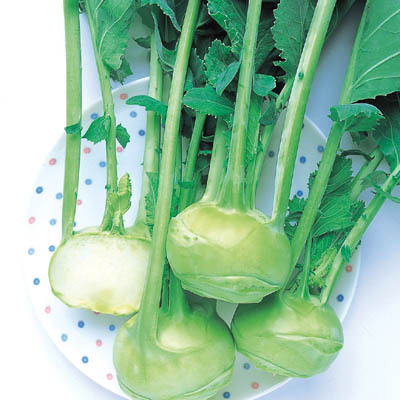 The swollen, edible stem of the baseball-size kohlrabi, which has the crispiness of an apple and a slightly sweet taste similar to broccoli stems, is best eaten raw (peeled and sliced for a salad or slaw). It’s also good steamed or boiled. Also known as Cos (for the Greek island from which this thick-ribbed lettuce is believed to have originated), flavorful and crunchy Romaine is very low in cholesterol and high in fiber. 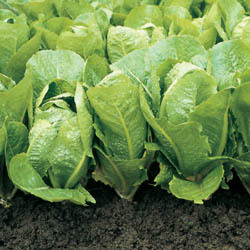 The standard lettuce used in Caesar salad, Romaine has a good shelf life if refrigerated and is a fine substitute for iceberg or other lettuce. This eclectic assortment of eight young salad greens provides a wonderful collection of color, texture, and flavor. The carefully formulated mix includes lettuces New Red Fire, Black Seeded Simpson, and Oakleaf; Oriental mustards Green Boy and Red Giant; Oriental green Early Mizuna; Kale Red Russian and Spinach Melody. 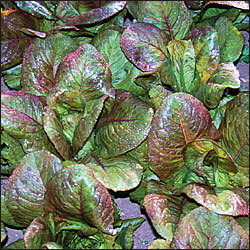 Red Cimmaron Romaine Lettuce Grown in the U.S. since the 1700s, the popular “Little Leprechaun” is a crisp, tender green whose large, loose heads feature 12-inch leaves that range in color from dark red to bronze. Excellent for salads and garnishes, the fiber- and vitamin-rich romaine is nutritious and heart-healthy. If stored correctly, it will keep refrigerated for 5 to 7 days. This loose-leaf lettuce gets its name from the shape of its attractive dark-green rosettes, which are shaped like oak leaves. 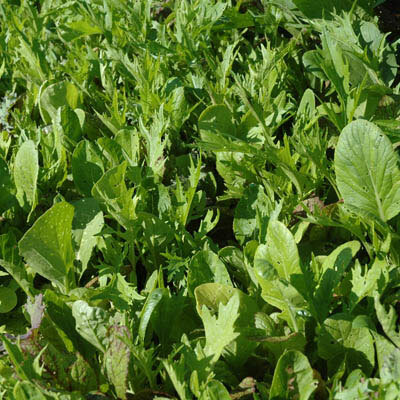 With its mild flavor and tender texture, Royal Oak combines well in salad with other lettuce varieties. And because it’s particularly heat tolerant, this vitamin A-rich vegetable retains its sweet, nutty flavor throughout the summer. The aromatic leaves of this soft-stemmed herb, alternatively known as knotted marjoram, resemble oregano in flavor, although with balsam and citrus overtones. 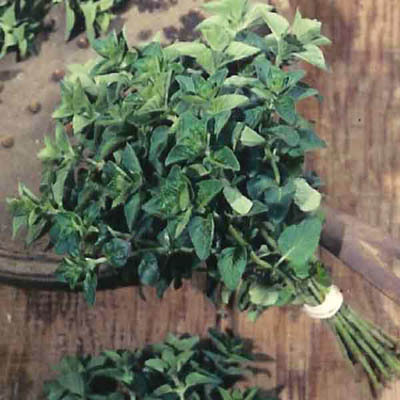 Like oregano, sweet marjoram can be added fresh to salads, soups, and, in particular, Italian dishes. In its dried form, it’s typically used in teas (it aids digestion) and as a steam inhalant. 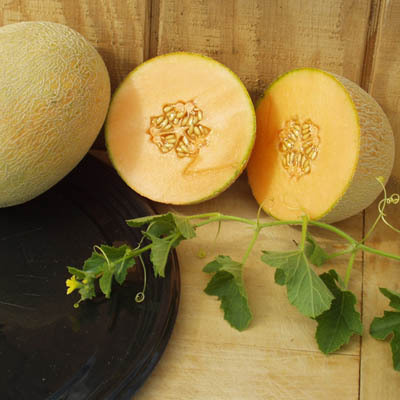 Nothing says summer like a ripened cantaloupe, and this the succulent, aromatic melon lives up to its lofty name. Weighing in at about 4 to 6 pounds, this oval, Athena-type muskmelon has a super-sweet orange flesh that makes it perfect for anything from smoothies to fruit salad. But be forewarned: these melons come early in season and go quickly. Rich in antioxidants, mustard greens belong to a family that includes broccoli and Brussels sprouts. Although some varieties of mustard have a pungent, peppery flavor, Savannah is mild. And it’s perfect for everything from soul food to state dinners: when Queen Elizabeth II visited the White House in 2007, this savory plant made the menu. 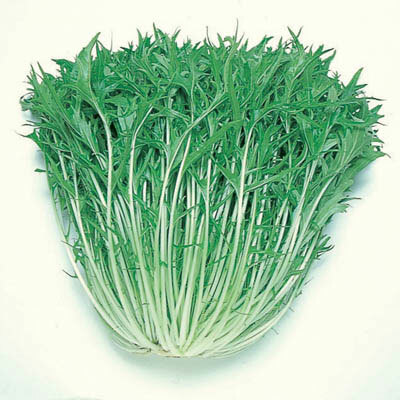 Mizuna’s mild mustard flavor makes it a staple item for use in salad mix or as a bunched green. 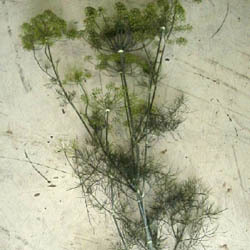 Deeply serrated medium-dark green leaves on long white pencil-thin stalks. 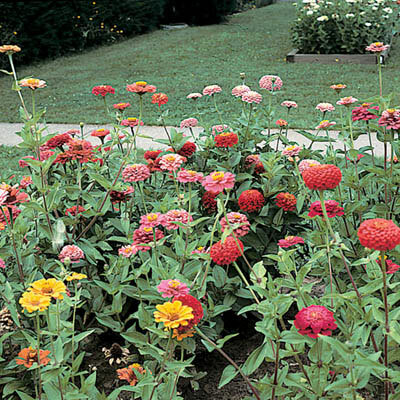 Vigorous and prolific for extended harvests. Slow to bolt; cold tolerant. 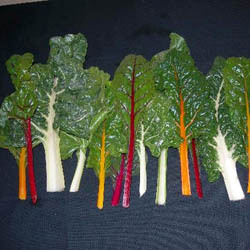 This green is ideal for harvest at a baby leaf stage when it has its best dark red color. 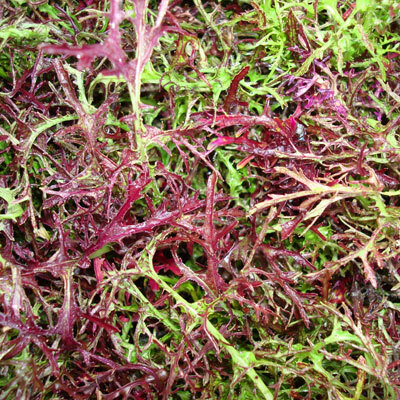 It can be sold as a specialty Asian green or blended into a salad mix to add a mustardy flavor, texture and red color. The leaves are deeply serrated and produce their best color during periods of cool growing temperatures. This is the major variety of domestically grown okra for chopping into soups and fresh-market sales, and for good reason: the bright-green, meaty pods are entirely spineless and boast a full-bodied flavor. Known as “gumbo” in some regions of the country, okra is a staple of traditional Southern cuisine, whether it’s fried, pickled, or used in stews. Also known as purple onions, these medium-to-large-sized onions are versatile: mild and sweet enough to eat raw in salads and on sandwiches, they’re also great in stews, soups, and barbecued in shish kebabs. 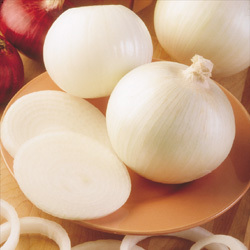 Like other onions, these should be stored in a dry, dark, well-ventilated place, rather than in the refrigerator. 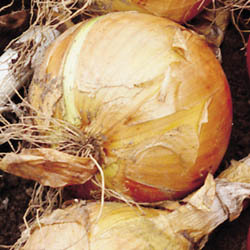 These are the onions of choice when cooking Mexican or other Hispanic dishes, as they have a tangier flavor than yellow onions. Low in saturated fat and cholesterol, white onions are an excellent source of vitamin C. Look for firm white onions that are free of blemishes and have even-colored, paper-dry skin. A high sulfur content may leave you teary-eyed at the cutting board, but it also provides the unique flavor that makes this onion a kitchen staple. 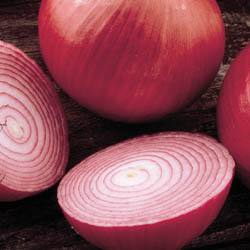 Brought to the New World by Christopher Columbus, onions are nutritious and, research shows, heart-healthy and valuable as everything from an anti-inflammatory to a shield against cancer. With its aromatic and pungent taste, this well-known culinary herb is a staple of Greek, Spanish, and Italian cooking (pizza and pasta sauces, in particular, just wouldn’t be the same without it). Native to the Mediterranean and a close relative of marjoram, dried oregano—a process easily done at home—is often more flavorful than the fresh. 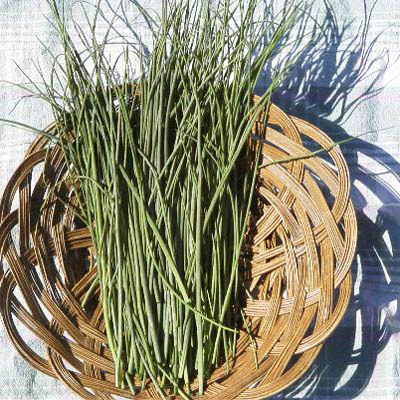 Tender young stalks are preferred as they are crisper. The leaves and stems are prepared in various ways, often stir-fried or steamed with garlic and some soy sauce to add taste. The leaves are sometimes preserved by salting or are dried to be used in soups. 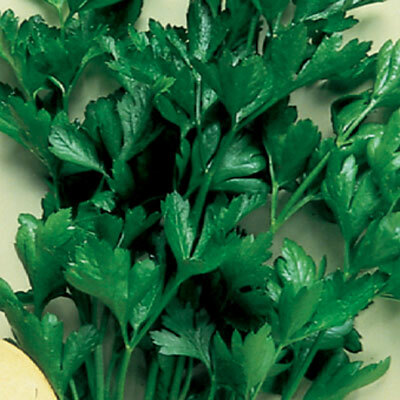 This “celery-leaf” type parsley, with its shiny, dark-green leaves, boasts a crisp and intense taste that other varieties of parsley simply can’t match. Given its freshening qualities, parsley is great as both a garnish and as an enhancement to a variety of dishes (given its intensity, use sparingly). 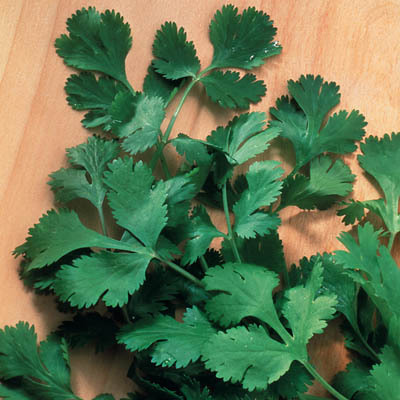 Italian parsley’s flat leaves also make it ideal for drying. With pods that boast a half-dozen plump, sweet, and tender berries, these longstanding favorites (they were first sold in the U.S. in 1908) are great for canning, freezing, or—our favorite—eating fresh-picked. A fine source of vitamins and minerals, these wrinkled peas stay tender and sweet even when they’ve fully ripened. 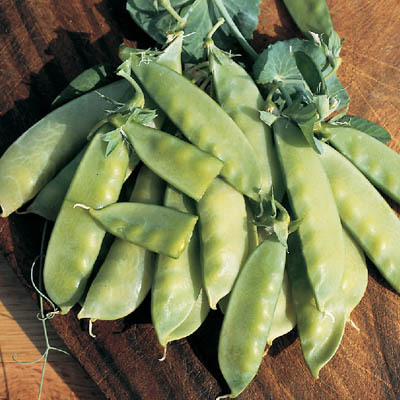 These sweet and juicy sugar-snap peas (aka snow peas), are ideal for stir-fry dishes. Developed at Oregon State University, and released to the public in 1985, James Baggett’s crisp and tender creation also does well when lightly steamed. 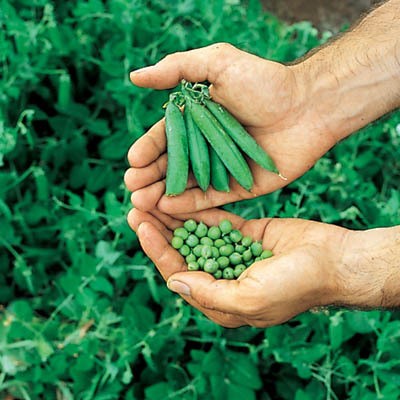 And there’s no need for shucking, as the flat and stringless 5-inch pods are entirely edible. 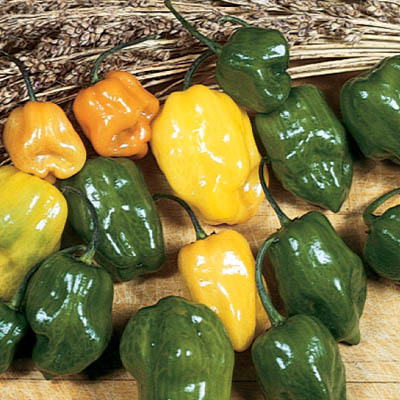 With a shape and color that resembles a banana, this mild to moderately hot member of the chili pepper family is unusually versatile: it can be eaten raw, served roasted on sandwiches, or pickled for a variety of uses. Or wash them, freeze on a cookie sheet, stash in freezer bags, and keep handy for home-made soups or pizza. 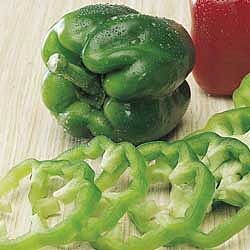 This large, sweet pepper, whose 4-lobed walls are thick and crispy, has that recognizable blocky shape that makes it so ideal for stuffing. But this meaty, green hybrid has other uses, as well: in addition to its raw use in salads, it’s a staple of Italian and Cajun cooking, and is perfect for roasting or grilling. This skinny and succulent chili pepper, which grows to about 8 inches, packs just the right amount of heat (3,000 on the Scoville scale) for Mexican sauces and fresh salsa (by comparison, habanero peppers may register 300,000). 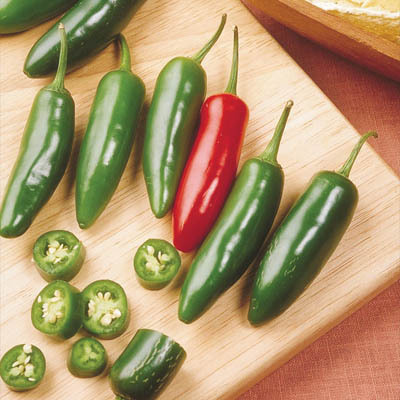 The smooth pepper, which turns from green to bright red when mature, can also be stir-fried, roasted, or pickled. The heat is on with these thin-fleshed, fruity peppers, which are so potent that you may want to wear gloves when handling. The inch-plus, lantern-shaped habanero is originally from Cuba, and will add a mule kick to your kitchen creations. 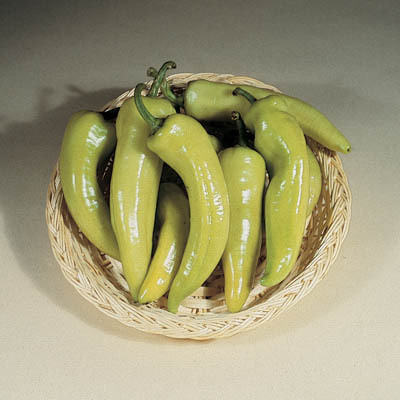 If they’re too fiery for your taste, try our Serrano peppers instead. Here’s a popular chili pepper whose heat doesn’t quite live up to its reputation as the equivalent of a 2-inch flame thrower. 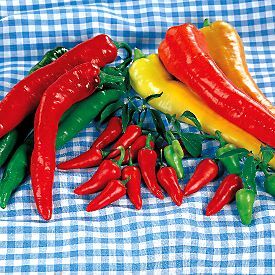 These meaty, tapering peppers, which turn from green to red at maturity, have thin walls and therefore don’t need to be peeled or steamed before using. Use as a substitute in recipes for ultra-high-heat habaneros. 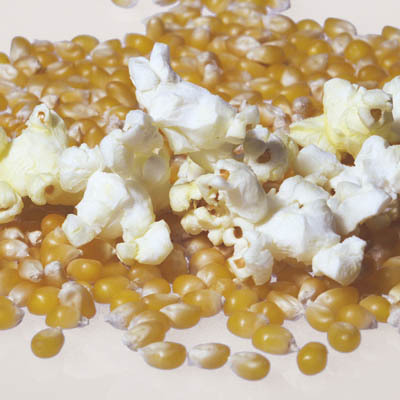 These corn plants produce large ears with deep, bright-yellow kernels that, when dried, explode into tender and delicious “sunbursts.” A favorite with kids, the kernels pop uniformly in anything from a hot-air machine to a wok or stovetop Whirley-Pop. If butter and salt are no-nos, try garnishing with herbs, vanilla, honey, or olive oil and tarragon. When it comes to French-fries, blue potatoes are a cut above the rest. 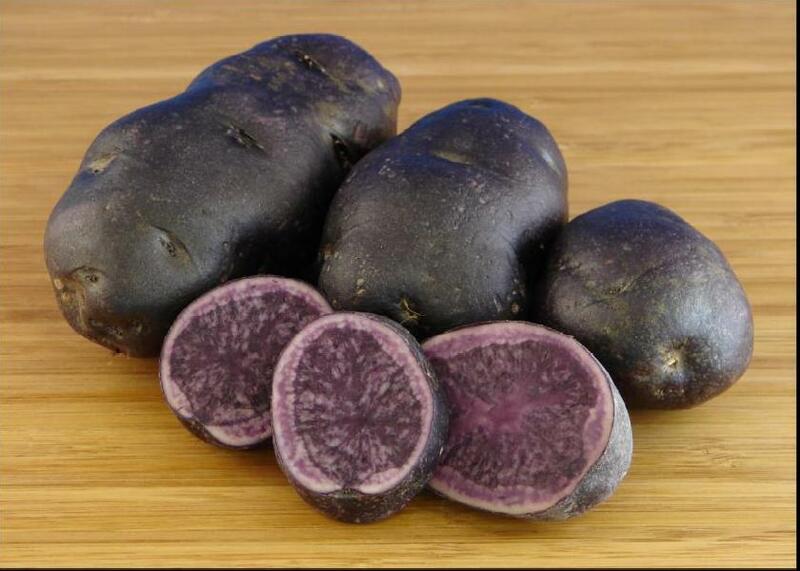 With their deep blue—almost purple—skin and flesh, these medium-sized and nutritious tubers offer up a slightly nutty taste. They’re also great for mashing or smashing (try it with the skin on), and a must for that July 4th red, white, and blue potato salad. 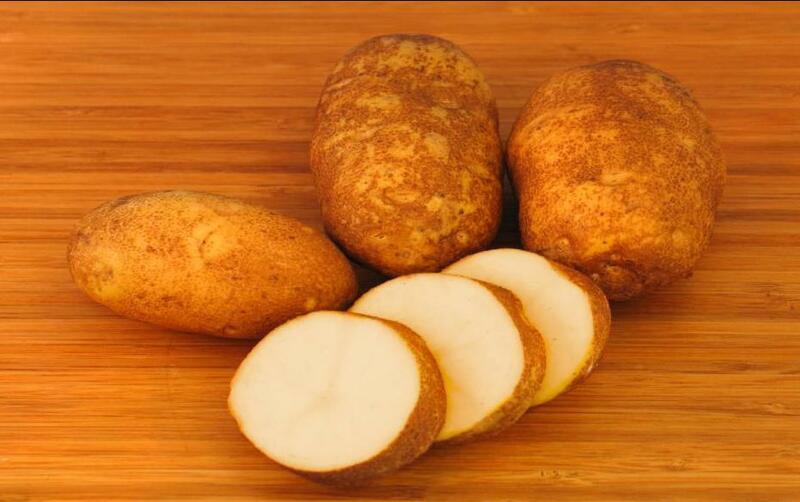 This large and popular all-purpose potato is the pride of Maine—a great-tasting vegetable with light-tan skin and hard, white flesh that’s especially fine for baking and a can’t-go-wrong choice for boiling, steaming, or mashing. Kennebecs’ shallow eyes make peeling easy, although you may want to leave the smooth skin on. 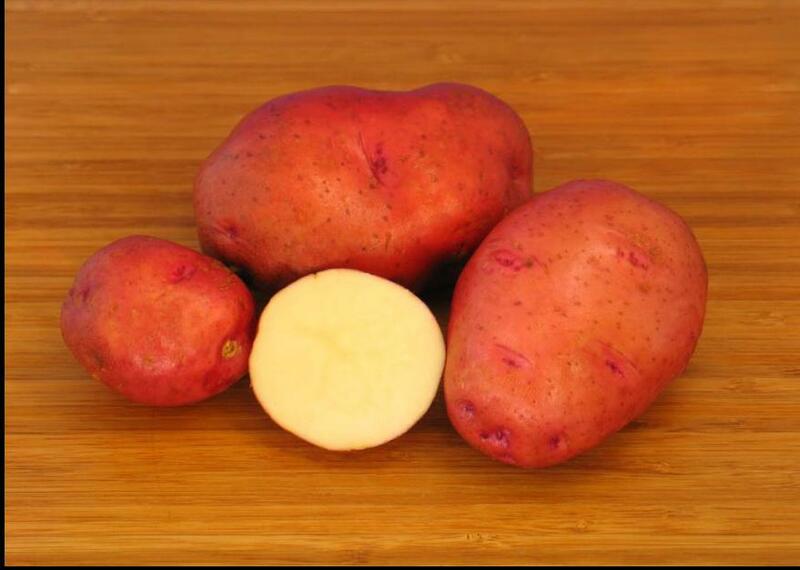 There are more than 5,000 varieties of potatoes on the planet, and these round, red ones are among our favorites. With their smooth, thin skins and firm, white innards, red potatoes add color and taste to everything from soups to salads. 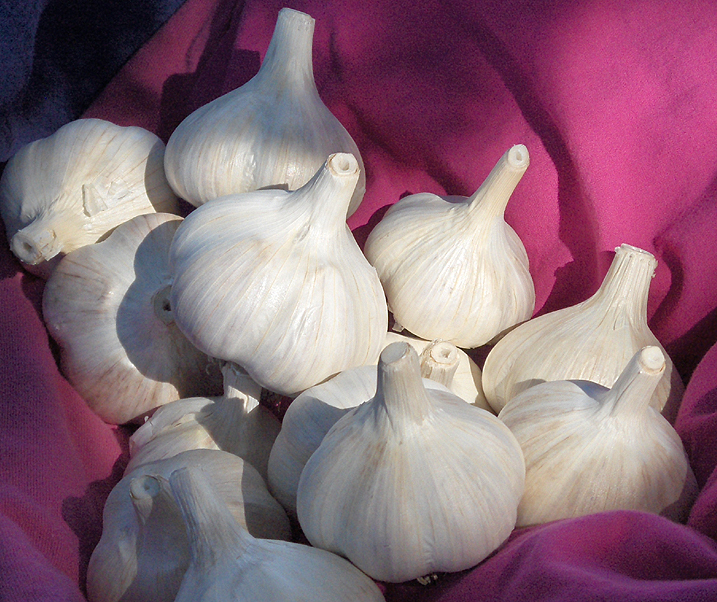 Grill or roast them; bake or boil them; or sautée them in oil and top with dried herbs. 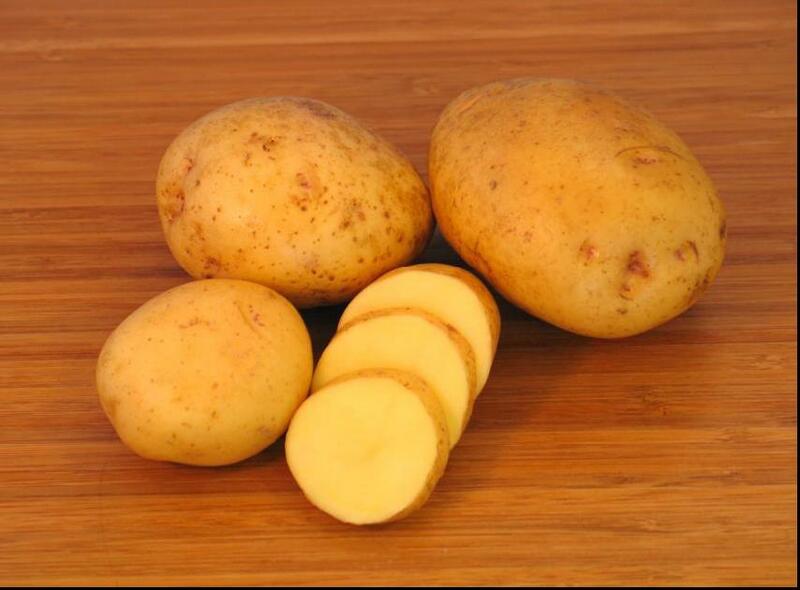 These large, smooth-skinned yellow potatoes have been immensely popular since their 1981 release, and it’s no wonder: with a fine-grained texture, a golden, buttery-tasting flesh, and a slightly elevated sugar content, any preparation method gets a thumbs-up. But consider roasting, as that higher sugar content turns them a mouthwatering golden brown. 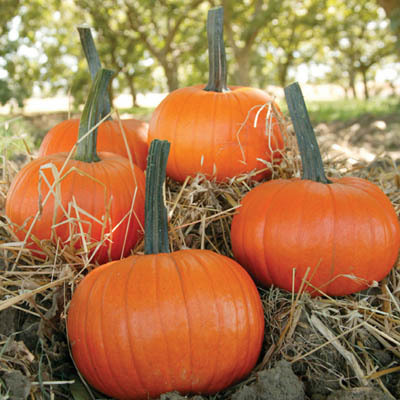 We feature a 5-to-7-pound pumpkin with a deep-orange color and a distinctive long, well-rooted handle that makes it easy for schoolchildren to carry them from the field and then home from school. 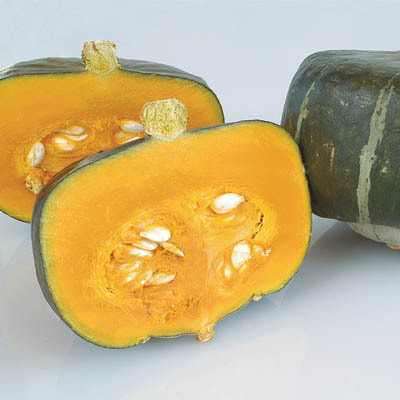 Like other pumpkins, this slightly flattened squash can be boiled, baked, steamed, or roasted. And it’s ideal for your home-made Thanksgiving pie. This hybrid red radish boasts slightly oval fruits that are 2 inches in diameter with vibrant scarlet skins and a crispy pure-white flesh with an ultra-mild flavor. We like to slice these radishes and add them to our salads or sandwiches. As a rule, radishes should be wrapped in plastic and refrigerated, which will keep them fresh for several days. Close relatives of the mustard plant, vitamin-rich radishes are great for garnishes or adding to fresh vegetable juice (sinuses beware). 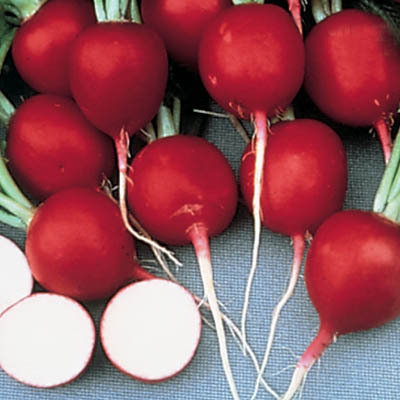 Radishes come in several varieties, and this familiar round, bright-red-skinned number is the one typically be found in supermarkets. 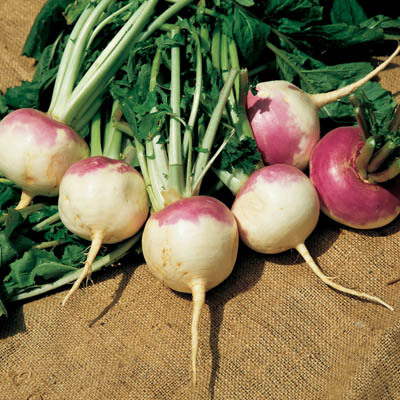 With its peppery, white interior, this radish makes a great addition to a garden salad. Radishes are a great source of vitamin C—which acts as an antioxidant and anti-inflammatory—and such minerals as iron and iodine. 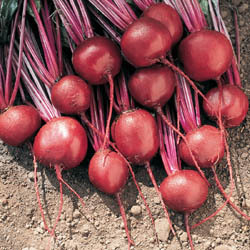 The French Breakfast radish (aka a Flambo radish) has an elongated red outer skin with a white splash at the root end. 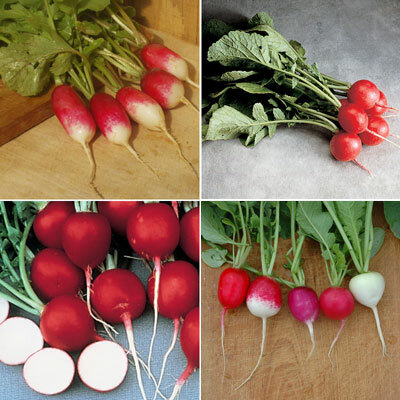 This spring radish, which can grow to about three inches, is slightly milder than other varieties. 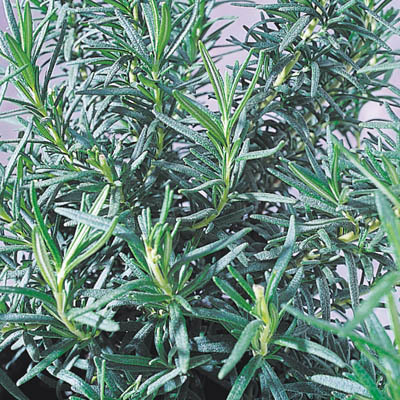 The fragrant needle-like leaves of this evergreen perennial are used fresh or dried on poultry and beef. Native to the Mediterranean region, this iron- and calcium-rich member of the mint family is good for barbecuing (it emits a mustardy aroma) and can be made into tea. 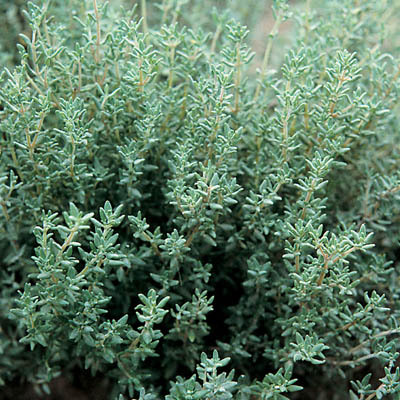 But beware: consuming large quantities of rosemary leaves can be injurious, even fatal. 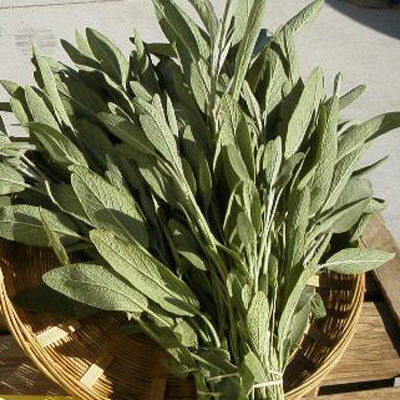 The oval, grey-green leaves of this perennial evergreen are used fresh or dried for seasoning in soups, marinades, and sauces (sage sprigs also add zest to some cocktails). 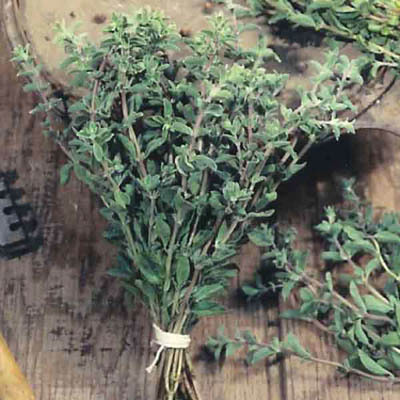 A peppery flavored member of the mint family, the oils in this well-known herb have antiseptic properties, so sage tea may help soothe a sore throat or mouth. 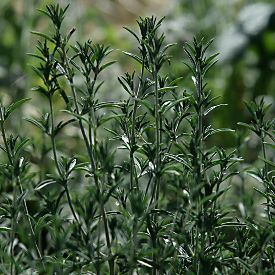 One of the essential ingredients of the dried-herb mixture Herbes de Provence, summer savory boasts a peppery aroma and taste that’s reminiscent of thyme. This annual herb has many uses, but it’s a particularly good seasoning for beans, peas, and lentils. And keep a sprig handy for bee stings: rubbing it on the wound brings quick relief. 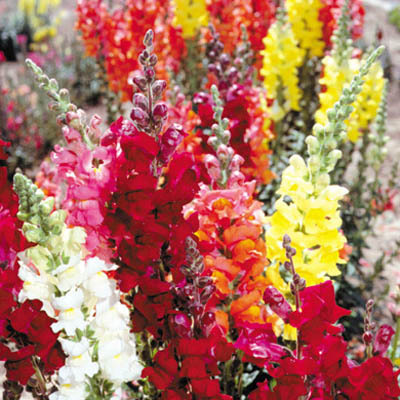 These vigorous, strong-stemmed snapdragon plants, which grow to a height of about 3 feet, produce bright, closely set flower spikes in white and various shades of bronze, pink, red, rose, and yellow. This garden favorite makes a great cut flower, and children enjoy watching the dragon mouth flowers open and close when squeezed. This semi-savoyed (i.e., crinkled-leaf) hybrid produces large upright plants that keep their big, thick, deep-green leaves free of dirt. Great for salads and cooking, spinach is high in vitamin and minerals and has been shown to be a natural anti-inflammatory. 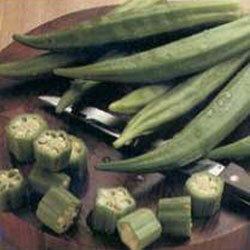 Overcooking destroys nutrients, so blanching it for a few seconds is one good preparation method. There’s nothing quite like fresh spinach salad, and Olympia—with its thick and smooth, easy-to-clean dark-green leaves—is the perfect variety for this summertime favorite. 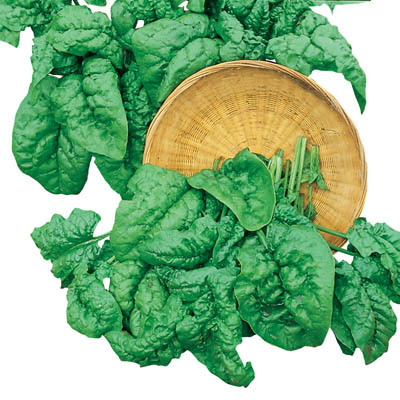 Like other varieties of spinach, this hybrid is loaded with vitamins and minerals, most notably iron. Although best raw in salads, it also a fine choice for steaming or sautéing. 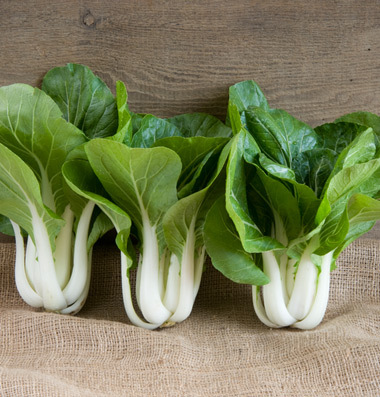 Baby spinach may be in vogue, but it’s got nothing on this tasty and tender large-leafed spinach, believed to have originated in Asia more than a millennium ago. 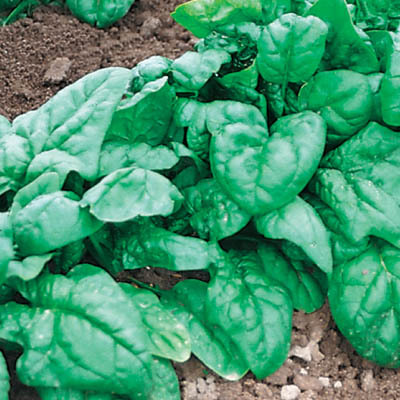 Rich in nutrients, whale spinach has smooth leaves that makes it easier to clean than other varieties. 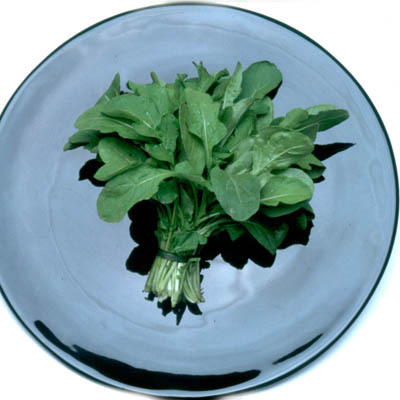 Its dark-green leaves are especially good in salad. This Lebanese-type squash, which grows to about 6 inches in length, has a blocky, slightly tapered appearance and a sweet, nutty flavor that makes it a staple of many Middle Eastern diets. Like other squash varieties, the light-green Barq is very low in saturated fat and cholesterol and rich in vitamin E, niacin, and calcium. Here’s a buttercup-type winter squash whose thick, orange flesh cooks up unusually creamy and sweet (thus the “bonbon” name). These award-winning green fruits, which are blocky and flat on top, weigh about 4 pounds and are distinguished by silver stripes across their smooth skin. Substitute for sweet potatoes in traditional recipes, including Thanksgiving favorites. 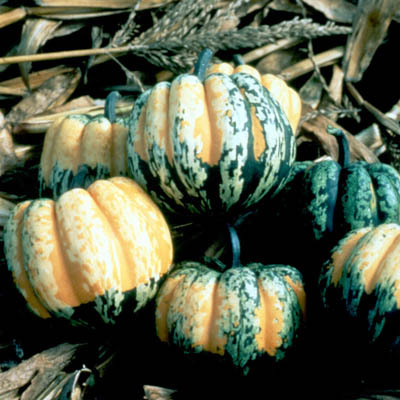 A small-to-medium-sized acorn-type squash whose cream-colored skin is uniquely flecked with green, gold, and yellow spots and whose slightly stringy yellow flesh tastes a bit like sweet potatoes or butternut squash. They can be stored for months, then pureed, steamed, or baked in a variety of ways, including this Moroccan style with vegetables and prunes. 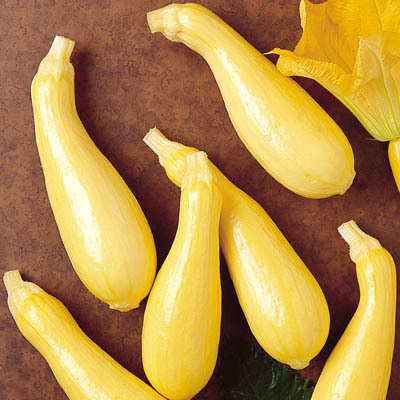 There are four groups of summer squash (straightneck types, crookneck types, scallop types, and zucchini), and this smooth, attractive, and well-proportioned yellow hybrid, with its classic bottle shape, is among our favorites of that first group. Unlike winter squashes, which can be stored for months, cougars and other summer squashes have a short storage life. 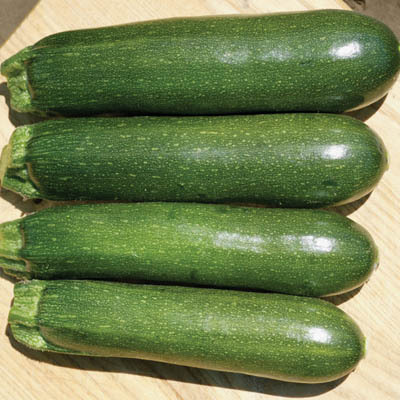 Felix is a medium-to-dark-green zucchini whose 7-inch cylindrical fruit has a delicate flavor. This versatile and low-calorie summer squash, which resembles a cucumber, can be steamed, boiled, grilled, or fried; it can also be shredded raw in salads or baked into bread. Zucchini scan be stored refrigerated in a plastic bag for up to 5 days. 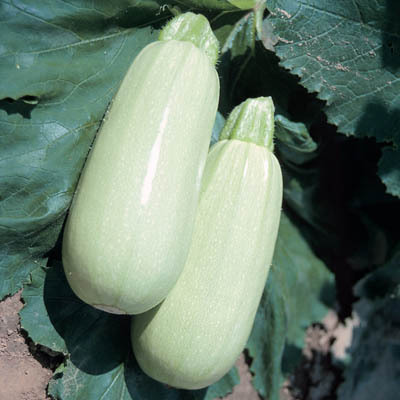 Reward is an attractive early-season zucchini (i.e., a small, cucumber-shaped summer squash) that’s straight and slightly tapered, topping out at about 8 inches. Larger, older zucchinis tend to be bitter, so look for those that are bright-skinned and firm. 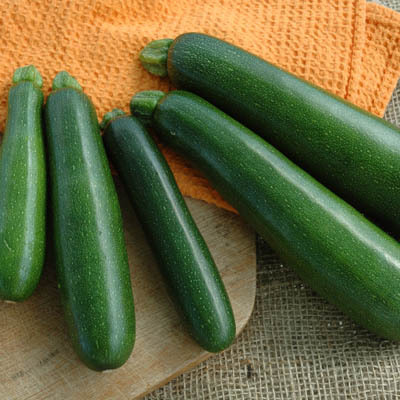 Zucchinis can be roasted, steamed, or shredded raw in salads. And we particularly like them barbecued or sautéed. Corn doesn’t get much sweeter than this yellow-and-white hybrid, whose 9-inch ears boast 18 to 20 rows of tender, tightly packed kernels. 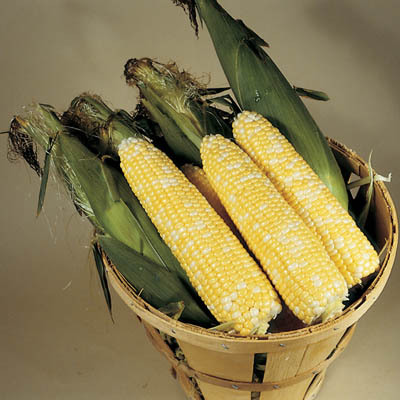 Much sweeter than standard sweet corn, this bicolor retains its enhanced sugariness for up to four days after harvest. And to extend your mid-summer memories, use this corn for canning or freezing. A close relative of the beet family, with a bitter and somewhat salty taste, Swiss chard is an especially nutritious leafy green vegetable (although it’s loaded with sodium). 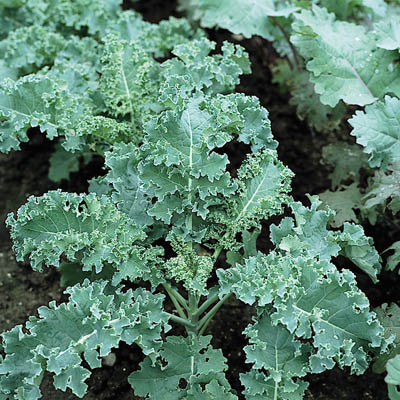 Both its leaves and thick, crunchy stalks are edible, making it a good alternative to greens like kale and collard. Try it braised, sautéed, or a variety of other ways. The aromatic leaves of this shrub are used fresh or dried to flavor a wide variety of dishes—our favorites include carrots, potatoes, and tomato sauces—although chefs typically prefer the pungent and versatile dried herb (it doesn’t lose its flavor when added early in the cooking process). It also makes a soothing tea good for anxiety and insomnia. 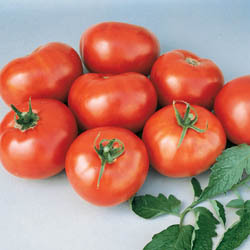 The Mexican husk tomato, which when ripe ranges in color from yellow to red to green, provides that uniquely tart flavor in Latin American green sauces. 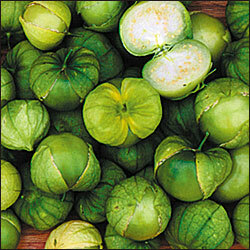 A relative of the tomato (although with a distinctly different taste), the tomatillo grows in width to about 2 inches and is covered by a papery outer husk. Use these “green tomatoes” for tangy salsa verde. Even if this plump and juicy, deep-red hybrid hadn’t been voted the best-of-decade tomato, we’d still grow it in abundance. After all, it’s a meaty, succulent, and great-tasting (albeit slightly acidic) local favorite—a classic globe-shaped hybrid that’s perfect for everything from sandwiches and salads to homemade salsa and spaghetti sauce. Reportedly passed down from the Cherokee Indians, this large (8 to 12 ounces) heirloom tomato ripens to a pinkish-purple, both inside and out. 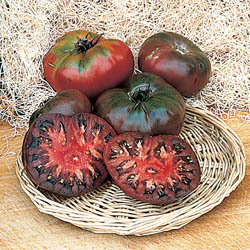 But if the color is unique (it’s sometimes called a “black tomato”), the taste of these round-to-oblong fruits is pure tomato: rich and sweet. Use them to add flavor and color to fresh garden salads. 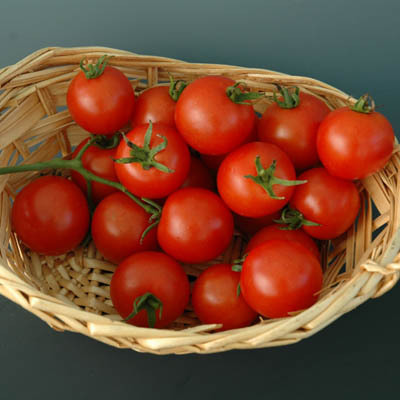 Cherry tomatoes range in size from marbles to golf balls, and Baby Cakes, at an inch-and-a-half in diameter, are at that larger end of the spectrum. These attractive cherries boast a deep-red color and a naturally salty taste. They’re great as snacks or stuffed with hummus or guacamole. Or use them to make bruschetta or even a simple pasta sauce. If you’re in search of a great tomato for paste, juice, sauce, or canning, this popular Italian heirloom is the one. 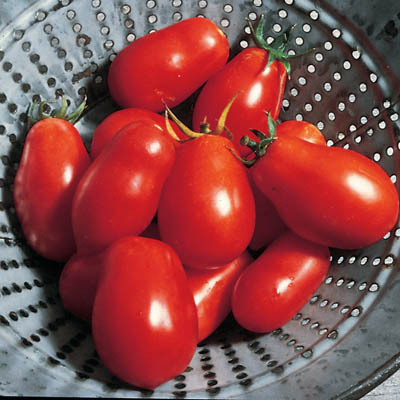 Low in acid and great in taste, with bright-red, meaty fruit and fewer seeds and water than other plum tomatoes, the firm, oblong-shaped Roma will also work well in everything from salads to salsa to sandwiches. 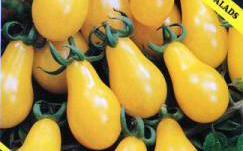 These bright-yellow, pear-shaped cherry tomatoes, which grow to an inch or two, are tender and mild—a zesty salad or snack food that’s low in acid and, as a result, sweet going down. Grown since the late 19th century, these vitamin-rich miniatures are great for hors d’oeuvres or preserves, and mix particularly well in a salad with cherry reds. Turnips are nutritious (high in fiber and vitamins) and versatile (they can be eaten raw, sliced for salads, or mashed like potatoes), but are still shunned by many vegetable lovers. This sweet and mild-tasting purple-top variety, the consensus favorite of turnip aficionados, just may make you a fan. And the leafy tops are among the finest-tasting greens. A vibrant blend of single and double, two-and-a-half-inch blooms, with colors that include coral, scarlet, light pink, deep lavender, soft yellow, and bright orange, these long-stemmed annuals add real pizzazz to cut-flower arrangements. And if you like them, you’re in luck: the more we cut them, the more they bloom (hence the name).